Nile monitors are occasionally seen in the pet trade but are not typically recommended as pets due to their large size and agility. Regardless of what kind of a pet they make though, Nile monitors are popular with the large lizard lovers because of their swimming and tree climbing abilities and sheer beauty. There are few of these lizards less suited to life in captivity than the Nile monitor. Buffrenil (1992) considered that, when fighting for its life, a Nile Monitor was a more dangerous adversary than a crocodile of a similar size. Their care presents particular problems on account of the lizards' enormous size and lively dispositions. Very few of the people who buy brightly-coloured baby Nile Monitors can be aware that, within a couple of years, their purchase will have turned into an enormous, ferocious carnivore, quite capable of breaking the family cat's neck with a single snap and swallowing it whole. Most Nile monitors resist attempts to tame them, keeping their aggressive personalities through adulthood. When they are young, Nile monitors will whip their tails if they feel threatened. Nile monitors will not hesitate to bite if they are stressed, and given their size, this is not pleasant. These pets are unsuitable for homes with small children, due to the animal's temperament and size. Nile monitors have voracious appetites. In the wild they feed on a variety of prey items including fish, eggs, insects, rodents, birds, and even other reptiles such as snakes. As pets, Nile monitors are usually fed insects (like crickets since they are readily accessible from pet stores) when they are young and pre-killed rodents like mice and rats as they get larger. 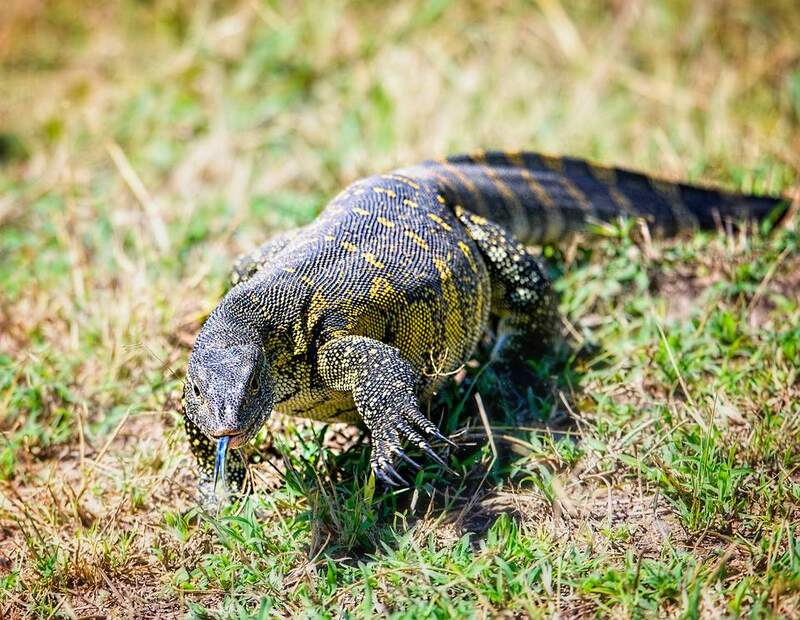 Wild Nile monitors eat live prey items but it is not recommended to feed live mice or rats to a pet Nile monitor due to the risk of the prey biting your lizard. Monitors that have especially large enclosures with numerous hiding spots may be at less of a risk for injuries from their food but the potential for bites is still there. Gut loading crickets and dusting them with calcium powder before feeding your Nile monitor is vital for a growing reptile but if you are feeding whole mice or rats it is not necessary to add anything to them. Juveniles should be fed daily and adults should be offered food a few times a week. Obesity can be an issue in adults who don't get enough exercise though so be careful you are not overfeeding your monitor. When considering how much an adult monitor eats in a week (several large rats) you can see how expensive owning a Nile monitor will get. Of course bigger is always better when it comes to reptile housing and this is especially true for a monitor that likes to climb, swim, run, and can grow to be nine feet long. At the bare minimum, your enclosure for a Nile monitor should be twice as long as your full grown lizard. This means your six foot monitor would have an enclosure that is 12 feet long. The housing also needs to be secure enough to prevent a monitor from escaping by burrowing under a fence or climbing out. A large water source, preferably one that your monitor can actually swim around in, is required along with something to climb on and hide in. An entire bedroom in a house is often used or secure, custom made, outdoor enclosures are great seasonally to provide natural sunlight. Nile monitors are native to Africa (although an invasive population is thriving in Florida) where the weather is hot. A basking spot temperature should reach 120 degrees Fahrenheit with a temperature gradient down to the 80's during the day and not dropping below 80 at night. A Nile monitor also requires UVB lighting. This light should be on a 12 hour cycle and the bulb should be replaced every 6 months, even if it doesn't burn out (unless the manufacturer guarantees it to last longer). The invisible UVB rays eventually run out from these bulbs and you are left with nothing more than a fluorescent bulb emitting white light. If your Nile monitor lives outside year round and gets natural sunlight this light is not necessary. Nile monitors are beautiful, large, strong, and aggressive reptiles. They do not make good pets but are hardy nonetheless. If you are considering getting a pet Nile monitor make sure you have a large and safe enclosure. You should also make sure you have the regular funding to pay for all the food it will eat over the next 20 years, check to see if it is legal to own a Nile monitor where you live, and if a vet near you is willing and knowledgeable to treat such a pet. Monitor lizards are susceptible to metabolic bone disease, the result of a diet that lacks calcium. It can also occur if the lizard is not getting enough UVB lighting. These lizards are not as prone to parasitic infections as other breeds, but can suffer from constipation due to impaction. They eat a lot, ​and sometimes ingest sand or other things they can't digest. If you suspect your Nile monitor has one of these conditions, you should seek treatment from a veterinarian who specializes in lizards.